Post Game Damage, originally uploaded by NiteMayr. Here’s a close up shot of the damage in action. I think it has stopped creeping over now so I am stuck with this. It still works, so the drama should trickle off now. Unless I go all emo and start cutting or something, then the drama would continue. In case I DO go emo, someone get there hands on some Hanson and Avril Lavigne and stand outside my window with it on a boom box. 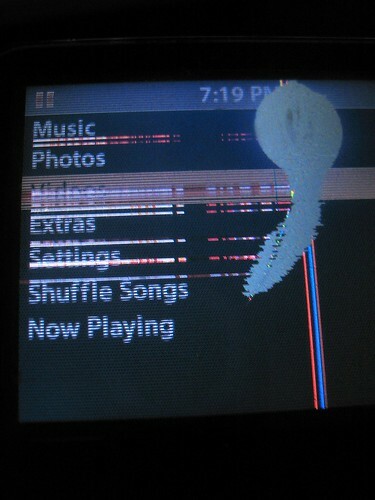 Broken iPod, originally uploaded by NiteMayr. 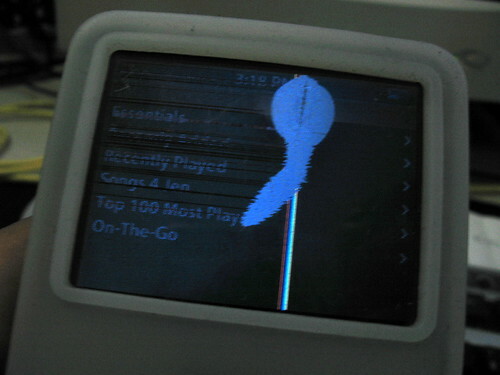 Here is NitePod, all broken.